Meet an unlikely mix, a family of friends. 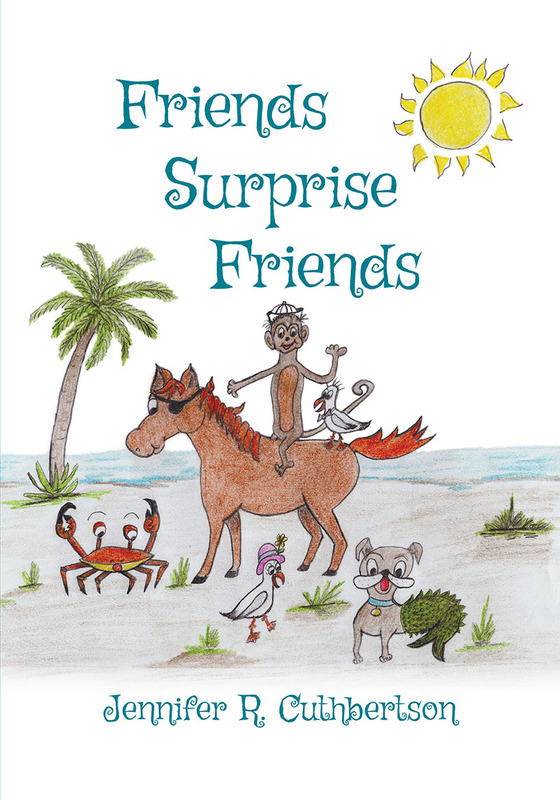 Puppy Fish, Captain Danny, Cranky Crabby Crab, and Sunny, the monkey, who pushes the limits with his pranks. Meet an unlikely mix, a family of friends. Puppy Fish is a different type of animal, half dog half fish, much like a doggie mermaid, with a huge heart full of compassion. A one-eyed patch wearing pony named Captain Danny. Even with his vision disability his desire to help others with his kindness abounds. A side walking Cranky Crabby Crab, with a mood disorder, is always wants to go play. Despite his crankiness and whining, his friends show patience and kindness. Sunny, the monkey, pushes the limits with his pranks. Sunny receives understanding and forgiveness from his friends for his antidotes. Hokey and Pokey, the sea gulls, bring stability to the group of friend with gratitude and love for their family of friends. 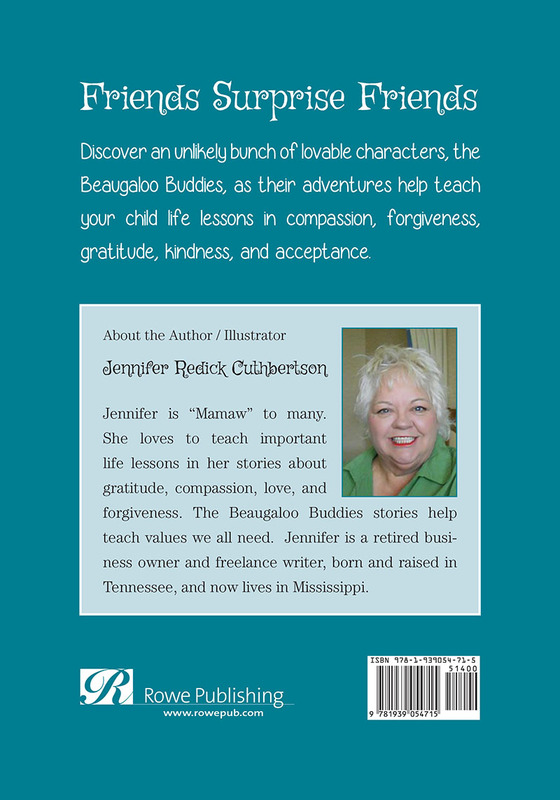 The Beaugaloo Buddies will help teach your child showing kindness, forgiveness, and gratitude toward others. Jennifer Redick Cuthbertson is “Mamaw” to many. 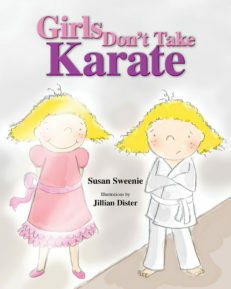 She loves to teach important life lessons in her stories about gratitude, compassion, love, and forgiveness. The Beaugaloo Buddies stories help teach values we all need. 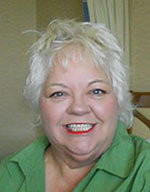 Jennifer is a retired business owner and freelance writer, born and raised in Tennessee, and now lives in Mississippi. Wonderful read! 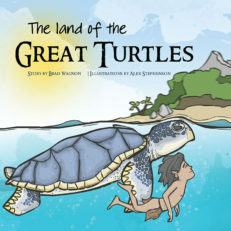 Wonderful book for kids of all ages. My eight year old grandson just loved it. I would definitely recommend this book. I was given Friends Surprise Friends as a gift. I am a first-grade teacher assistant and mother of two. I have read the book many times at home and at work. It’s a favorite with the kids. I bought several at Christmas to give to a Children’s hospital. I will be reordering more for another one of my charities soon. The books were a hit. Granddaughter loves the “baby seagulls.” I appreciate reading to her about kindness and having good friends. My 7-year-old daughter loved the pony wearing a patch. She has had several eye surgeries and felt she could relate to Captain Danny. 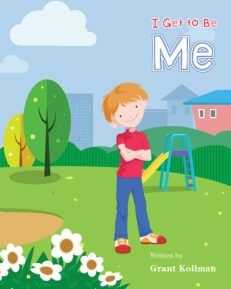 Great read, my children love to read it at bedtime.